>> The author created „Genetic Passport of a newborn“ including the most frequent blood and metabolism diseases which were previously registered in the population of Azerbaijan. By means of genetic screening phenotypic frequencies of α-, β-thalassemas and HbS and HbD genes. Three mutation types of β-thalassemia: 1. β°- IVS-2-1 (G-A), 2. β°-сodon 8 (-AA) and 3. β+- IVS-1-110 (G-A) were identified. Two phenotypes for hemizygous form of G6PD enzyme deficiency were revealed. The value change of thyreotrop hormone was identified in 2,58% examined newborns with increased values of HbA1c. Автором разработан «Генетический паспорт новорожденного», включающий наиболее часто встречающиеся заболевания крови и метаболизма, ранее зарегистрированные среди населения Азербайджана. Путем генетического скрининга установлены фенотипичекие частоты генов α-, β-талассемий, HbS и HbD. Идентифицировано три типа мутации β-талассемии; 1. β°- IVS-2-1 (Г-A), 2. ββ°-сodon 8 (-AA) и 3. β+- IVS-1-110 (Г-A). Установлено два фенотипа для гемизиготной формы дефицита фермента Г6ФД. Выявлено изменение значения тиреотропного гормона у 2,58% обследованных новорожденных с наличием повышенных значений HbA1c. ავტორის მიერ შექმნილია ,,ახალშობილის გენეტიკური პასპორტი’’, რომელიც მოიცავს აზერბაიჯანის პოპულაციაში რეგისტრირებულ მეტაბოლურ და სისხლის ყველაზე ხშირ დაავადებებს. გენეტიკური სკრინინგის გზით დადგენილი იქნა ისეთი ჰემოგლობინოპათიების გენების ფენოტიპური სიხშირე, როგორიცაა α-, β-თალასემიები, HbS და HbD. იდენტიფიცირებულია β-თალასემიის მუტაციის 3 ტიპი: 1. ββ°- IVS-2-1(G-A), 2. β°-сodon 8 (-АА) და 3. β+- IVS-1-110 (G-A). დადგენილია ფერმენტ G6PD-ის დეფიციტის ჰემიზიგოტური ფორმის ორი ფენოტიპი. გამოკვლეული ახალშობილების 2,58%-ში გამოვლენილია თირეოტროპული ჰორმონის მნიშვნელობის ცვლილება HbA1c-ს მნიშვნელობის მომატებით. 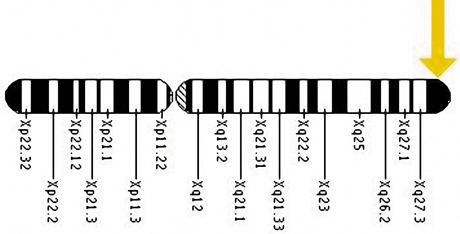 The G6PD gene is located on the long (q) arm of the X chromosome at position 28. More precisely, the G6PD gene is located from base pair 153,412,799 to base pair 153,428,662 on the X chromosome. Taking into account the above said, the goal of our studies is the research of inherited diseases as phenylketonuria (PKU), hypothyriosis, G6PD enzyme deficiency and hemoglobinopathies (HP) among newborns and development of the unique program for their screening. ﻿We have to mention the fact, that screening of such inherited diseases as phenylketonuria, hypothyriosis among newborns was not done at all. Sporadic studies of hemoglobinopathies exist among newborns in the Republic. The material was gathered in the maternal department of the Central Oilers’ Hospital between 2003 and 2005. The overall number of newborns – 2677 (1287 boys and 1390 girls). For the first time „Genetic passport of a newborn“ was ­de­ve­loped including most frequent encounted blood and metabolism inherited diseases previously registered in Azerbaijan population. For that purpose newborns’ blood screening of the thyrotrophic hormone (TTH), PKU, HP, G6PD enzyme deficiency was carried out in Baku city. To identify the frequency of inherited HP’s among newborns we used set of methods including analytic method of isoelectrofocusing (IEF) in polyacrylamide ampholine plates with pH 3,5-9,5 and 5,5-8,5, test for sickle-cell, hemoglobin solubility test, quantitative analysis of fetal hemoglobin and erythrocyte osmotic resistance test.3 Quantitative analysis of TTH was done by „PERSONAL LAB“ (Germany) apparatus by means of ADALTIS agents provided by „HUMAN“ company (Italy). To diagnose PKU in newborns we used probe of Felling and method of thin-layer chromatography. For that purpose we used urine and capillary blood of newborns. НbА1с level screening was carried out by IEF. In case of НbА1с increase (visual assessment), the quantitative identification of НbА1с was done on Dimension device (USA). ARMS method was used for beta-thalassemia mutations identification (Fig 2). In 55 out of 1128 examined newborns we could identify α-thalassemia in 28 newborns, β-tha­la­sse­mia – 28, HbS – 4, HbD in 1 newborn with pheno­ty­pic frequency of 2,48%; 1,95%; 0,35% and 0,09%, respectively. To identify mutation types of β-thalassemia we used the following oligonucleotide primers: 1. βo- IVS-2-1 (G-A), 2. βo-codon 8 (-AA); 3. β+- IVS-1-110 (G-A);4. β°-codon 8/9 (+G); 5. β+- IVS-1-6 (T-C) and 6. β+- IVS-1-5 (G-C). 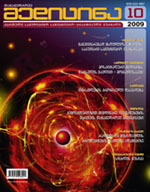 3. substitution of guanine by adenine nucleotide in the position 1 of the second major intron of ββ-globin gene with phenotype of ββo-thahlassemia – βo- IVS-2-1 (G-A). The level of thyreotropic hormone (TTH) was identified in first 3-5 days of newborn’s life. When the level of TTH was from 30 IU/l to 50IU/l, the test was repeated. When level was higher than 50 IU/l we recommended newborn’s mother to approach the physician after leaving the maternity house. In newborns we observed the modal distribution of TTH. There have been identified hypo- and hyper-function of the thyroid gland, which is directly linked to CNS abnormalities in children. The relation between values of TTH and HbA1c was also identified. The obtained results of genetic screening of TTH and HbA1c allow pediatricians to carry out treatment of the affected children in time before the clinic manifestation shows itself. Screening carried by us in urine among 1827 newborns allowed us to identify PKU in 4 newborns. For diagnostics confirmation the blood sampling in newborns and thin-layer chroma­to­graphy of serum aminoacids have been done. In all four cases compared with control group we ob­ser­ved significant increase of phenylalanine ami­noacid level. In 28 newborns we managed to diagnose G6PD enzyme deficiency. In 22 boys hemizygous state of G6PD enzyme deficiency with two phenotypes was identified. In the first case in 15 boys we revealed total deficiency of the enzyme: “0”- phenotype. In the second case in 7 boys we observed remnant activity with its variation from 10 to 30% of normal enzyme activity: “+”-phenotype. Clinical research of newborns allowed us additionally to identify Down syndrome, Spina bifida, hemolytic disease of newborns, acephalia, skeletal abnormality, including polydactylia, cryptorchism and hypospadia in boys. Thus, by means of genetic screening of newborns in Baku city we managed to reveal such forms of inherited hemoglobinopathies as α- and β-tha­lassemias, abnormal S and D hemoglobins, G6PD deficiency and TTH hormone level, phenylketonuria as well as Down syndrome, Spina bifida, newborns’ hemolytic disease, hydrocephalia, acephalia, cryptorchism and hypospadia in boys. Newborns’ genetic screening obtained results will allow pediatricians physicians to treat affected children before the clinical manifestations show themselves. For purpose of inherited diseases prophylaxis in newborns in the families with genetic risk it is recommended to carry out the prenatal diagnosis by using DNA technologies. • For the first time we created “Genetic Passport of a newborn”, including the most frequent diseases of blood and metabolism which were earlier registered in the population of Azerbaijan. • The changes of TTH value in 2,58% of examined newborns with increased values of HbA1c were identified. • Phenotypic frequencies of αα-, ββ-thalassemias, HbS and HbD genes were identified. • Two phenotypes for hemizygous form of G6PD enzyme deficiency were found: phenotypes G6PD “+” and G6PD “-”. • Three mutation types of ββ-thalassemia: 1. βo-IVS-2-1 (G-A), 2. βo-codon 8 (-AA) and 3. β+-IVS-1-110 (G-A) were revealed.